After disgracing themselves in front of the entire world, a capella commentators Gail (Elizabeth Banks) and John (John Michel Higgins) inform the Barden Bellas they have been placed on suspension. This means Becca (Anna Kendrick) and crew are no longer allowed to recruit new members or compete on the collegiate level. Finding a loophole in the suspension, Gail and John agree that if the Bellas can win the World A Capella Championship, they will be reinstated. Chloe (Brittany Snow) becomes obsessed with getting the Bellas prepared for their performance. Becca, meanwhile, has taken on a secret internship with a record label, in hopes of becoming a music producer. This leaves the Bellas hurting, as she is supposed to prepare their set. Although they are no longer allowed to recruit members, another loophole allows a “legacy” to join the group, since she came to them. Emily (Hailee Steinfeld) is the daughter of a long ago member (Katey Sagal), who idolizes Becca. The Bellas have been replaced on their post-Nationals tour by a German a capella group, Das Sound Machine. The Bellas are shamed by Das Sound Machine time and again, they must find their sound again, if they hope to beat Das Sound Machine at the World’s competition and bring honor back to the Bellas. 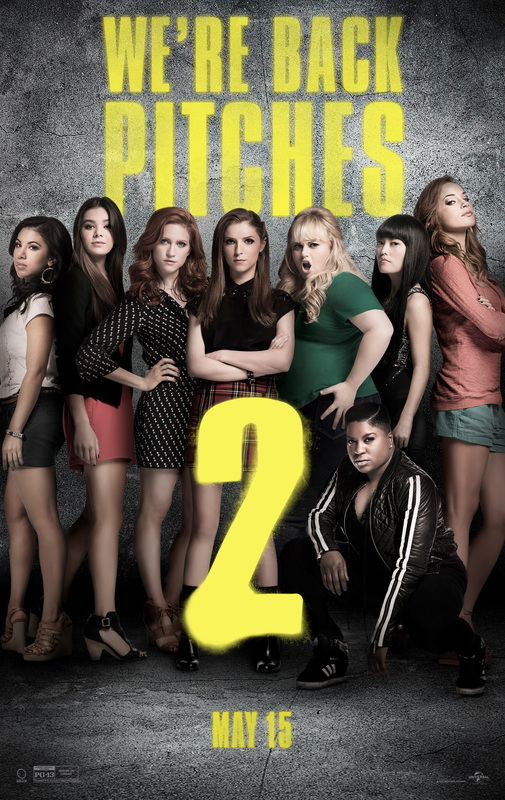 Pitch Perfect 2 falls victim to the same formula most sequels find themselves in. They try to take what was so successful in the first film and make it even more over the top. More often than not, it’s a recipe for failure. The most notable examples are John Michael Higgins and Hana Mae Lee. John’s misogynistic and racist jokes get so overboard, it’s shocking that when Gail finally says something, you wonder why she lets him go on so long. Hana Mae Lee is still the soft-spoken Lilly who whispers disturbing, often psychopathic facts at random times. The writers seemed to take the subtly of this that was so funny in the original, and take it up about 2 notches too many. Other than that, the film delivers pretty much as expected. It is packed full of a capella mashups of popular songs. Fat Amy and Bumper are still at their cat and mouse game. And the cast works well together. The only thing that really seems a bit out of place is an unsanctioned competition in David Cross’ basement. There is no real point to this, aside from giving more opportunity for performances. And a chance to watch the Green Bay Packers throw their hat in the a capella ring. Over all, it is an entertaining movie, though it is lacking a bit of the charm and oomph of the original. There are plenty of new faces to make it feel fresh, while bringing back all of your old favorites, because, let’s face it, that’s why you’re here. With plenty of laughs and full of a capella mashups, it’s not a bad way to spend a couple of hours.